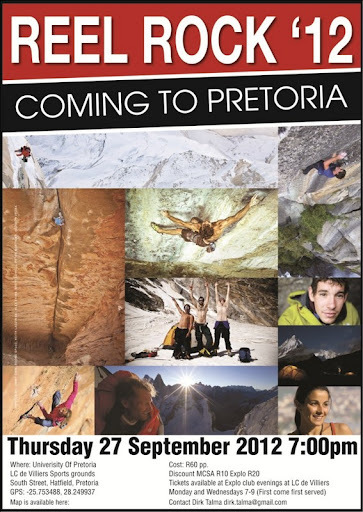 I heard a rumour reelrocktour 2012 will be at City Rock on thurs 27/9 at 20h00? The begging with the boss must start early. The rumours you hear are truth, Gavin. The dates you were given are when we plan to have the screening. The guys at Reel Rock are still editing like crazy to make their deadline on the 17th Sept so watch this space. Any chance it will be shown up north? Any word on if this date is finalized? CityROCK Cape Town: Wednesday, October 3rd. Southern Rock Durban: Thursday, October 4th. High Altitude PMZ: Friday, October 5th. working on Joburg and Pretoria. Hey guys...I presume the screening at City Rock will be in the evening? The date for the showing in Pretoria is confirmed for Thursday 27 Sept at 19:00 at the Sports Centre on LC de Villiers. It's close to the Exploratio climbing wall. R60 per person. R50 for MCSA members. R40 for Explo members. Last edited by dirktalma on Thu Sep 13, 2012 11:16 pm, edited 1 time in total. Southern Rock Durban, Thurs, Oct 4th, 7 pm. High Altitude PMB: Fri, Oct 5th, 7pm. We giving away two FREE RRT 2012 tickets *every day* for the next week. To enter, post the name of YOUR city where you want to attend and 'LIKE' Mountain Mail Order. MCSA, Waverley Hall. 7 for 730. SHARP. 3 cool local is lekker films have been chosen. plus Sharma, Ondra, the WIDE BOYZ, and Honnold. Sweet. It's P-town's turn tonight. Be at the LC de Villiers Sport Centre at 7pm. Bring some snacks, popcorn and your chalkbag to combat the sweaty palms. Thank you Robert and City Rock for making it possible to see these films. My palms were sweaty all night afterwards! Awesome film!! As Brian says sweaty stuff!! Reel Rock Tour 7 are awesome!! Can't wait for Reel Rock Tour 8! Agreed...The local films were super sweet as well!